It is extremely important for every well-rounded musician to have a solid grasp of music theory and ear training. These skills and knowledge will help you learn your music more quickly, accurately, as well as give you deeper understanding and appreciation of what is happening in the music you hear and perform. Who knows – if you study hard now, it may even get you out of 8 AM music theory if you decide to go to music school in college! The following music theory lessons and ear training drills will help reinforce the skills and concepts you have been learning in your group and private lessons since you were young. 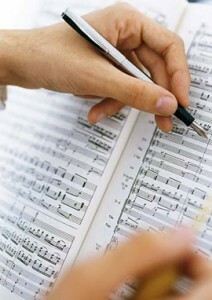 Remember: just like any skill, music theory and ear training take practice. Try to make ear training a part of your regular routine. And don’t be surprised if some of these drills are actually fun! Special thanks to Ricci Adams for creating these lessons and drills and making them available under the Creative Commons License. Learn about the staff, treble clef, bass clef, ledger lines, and the grand staff. Learn how a scale’s notes form special triads. Watch an analysis of O Canada!. Identify the displayed key signature. Identify the quality and type of the displayed interval. Identify the type of the displayed chord. Identify the note name of the highlighted piano key. Listen to the played interval and identify its type. Listen to the played scale and identify its type. Listen to the played chord and identify its type. Display the chord for a specified starting note, chord type, and key. Create your own custom tailored staff paper to print out. Copyright © 2000-2009, Ricci Adams. Except where otherwise noted, content on this webpage is licensed under a Creative Commons License.